Google today announced its Google Maps and Google Search apps will soon show critical information regarding natural and other disasters that may strike. 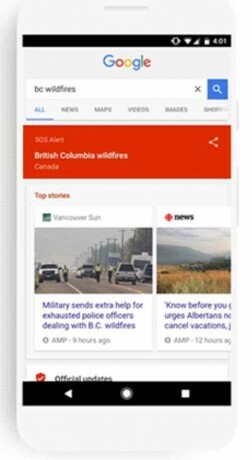 The SOS Alerts, as they are called, will appear at the top of search results and within maps as people look for information concerning the disasters or impacted areas. In Google Search, results will include pertinent news stories or broadcasts, emergency numbers, and relevant web sites. Those close to disaster areas may receive push alerts with the same information. In Google Maps, Google will showcase data concerning the event, phone numbers and web sites, as well as placement on the map and real-time information regarding road closures or changes to mass transit. Google partnered with agencies including the Federal Emergency Management Agency and the Red Cross to gain access to the information. Google is bringing SOS Alerts to its mobile Search and Maps apps for Android and iOS. The same information will also be available to desktop machines. Facebook this week said it plans to provide humanitarian and other aid organizations with real-time access to its maps during natural disasters and other emergencies. According to Facebook, it will strip user identities from its map data while still showing where people are moving, where people might be marking themselves as safe, and other, similar trending information.